The LEGO® Group originally developed LEGO® SERIOUS PLAY® as a method to help people from the corporate world formulate and shape their ideas about vision and strategy. 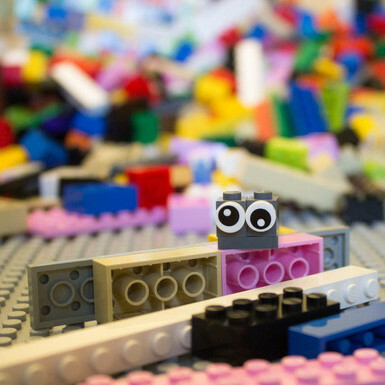 A large amount of companies now apply LEGO® SERIOUS PLAY® as a consultancy method. In addition, the method has found its entry into various other fields. Important for LEGO® SERIOUS PLAY® is “thinking” with your hands. In a sense, you actually express your thoughts and feelings through LEGO® models. These LEGO® models serve as metaphors and as visual sources of inspiration for further discussion. They offer the space to try out ideas and possibilities. The illustration on the right shows the way our motor skills are assigned to different parts of our body in relative proportion. What stands out are the big hands. Research shows that a large part of our locomotion is restricted to controlling our hands. A continuous exchange finds place between our brains and our hands. Scientists say that if you ask people to solve a problem, they are faster when they use their hands (to draw something, or write something down) than when they only use their heads. When someone builds a LEGO® model, you will find that not only a physical change takes place, but that something also changes in the brain. Using the LEGO® SERIOUS PLAY® method, you can discuss the most serious or sensitive issues, while also creating a relaxed and open atmosphere. Participants experience the joy of construction, they lose the sense of time, and for a moment they are only aware of their LEGO® model and don’t know when to stop. This is not just a nice bonus. On the contrary, don’t underestimate the importance of the playful nature of the method. By engaging in play, you can achieve more depth and meaning together. Working with the LEGO® SERIOUS PLAY® methodology tickles your imagination and will help you reach new insights and bring about real change as an individual, group, team or organization. A few years ago, the LEGO® Group has made the core of the methodology open source (under Creative Commons license). This immediately opened up opportunities to use the method outside of corporate life. In 2017, sociologist David Gauntlett applied it in his sociological research. Gauntlett wanted to know what effect the media have on people, and let participants build a LEGO® model in order to visualize how they view their own identity and what influences them in this. During his graduate studies at the Christian University of Applied Sciences Ede, Kaj ten Voorde then proceeded to prove that LEGO® SERIOUS PLAY® can also be used excellently in the context of church small groups. Because the information is open source, conversation circles can also start using LEGO® SERIOUS PLAY® by themselves. Additionally, you can follow a training (with certification) at the Association of Master Trainers in the LEGO® SERIOUS PLAY® Method. In the Netherlands you can do this at AvMM. Kaj ten Voorde followed this training after his graduation research and is certified as a LEGO® SERIOUS PLAY®-facilitator. Picture of how our motor skills are allocated proportionally to our body parts. 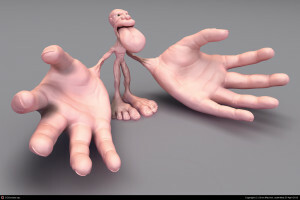 2)Image of Chris Macivor, http://guna3d.cgsociety.org/art/mudbox-3ds-max-sculpture-homonculus-photoshop-motor-3d-1047069 Based on the research of brain scientists Penfield and Rasmussen. The following list of literature on LEGO® SERIOUS PLAY® is only a selection. An overview of more literature can be found in my thesis, at the website of LEGO® SERIOUS PLAY® and at Serious Play Pro. Brown, S., Play, How It Shapes the Brain, Opens the Imagination and Invigorates the Soul. London: Penguin Books, 2010. Gauntlett, D., Creative Explorations. New approaches to identities and audiences. Abingdon: Routledge, 2007. Gauntlett, D., Making is Connecting. Cambridge: Polity Press, 2011. Heracleous, L., Jacobs, C.D., Crafting Strategy Embodied Metaphors in Practice. Cambridge University Press, 2011. Pain, H., “A Literature Review to Evaluate the Choice and Use of Visual Methods,” International Journal for Qualitative Methods 11, 4 (2012): p. 303-319. If you are interested in one of these books, you can purchase them via the website of Serious Play Pro.